Swollen Members spitter MADCHILD has announced he'll be back on the road in support of his recent solo release 'Switched On'. Better yet, the Super Beast has revealed he'll be hitting clubs with the newest Battle Axe warrior, Los Angeles rapper DEMRICK. 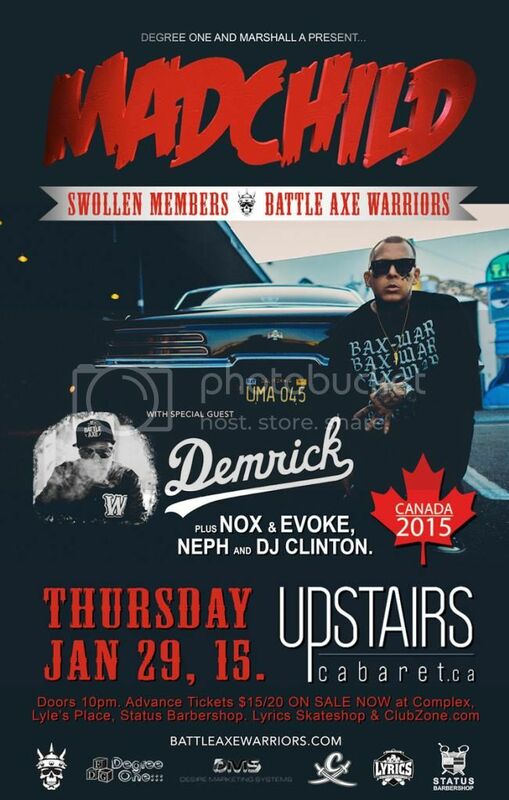 Though currently residing in L.A., Madchild's newly unveiled batch of dates has him hitting Victoria BC at Upstairs Thursday Jan 29th. The trip then has him and Demrick (formerly known as Young De) heading out as far east as Winnipeg before heading back towards the West Coast. Demrick's partnership with Battle Axe was officially announced today (November 17), with the label confirming it will be putting out the rapper's Losing Focus album out early in 2015. Though few details have been delivered in regards to the LP, it's expected to feature guest appearances from Demrick's Serial Killers partners in crime Xzibit and B-Real, as well as Dizzy Wright and Logic. Madchild said in a statement of the signing: "We're excited to have Demrick join the family and join forces with Battle Axe for the release of his new album. We've been following Demrick's career for quite some time, and he's putting out quality music that pays respect to the culture of hip-hop.